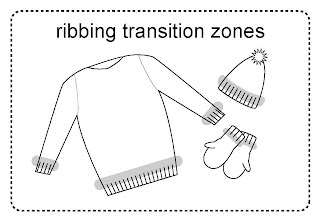 The transition zone where the ribbing meets the sweater (hat, mitten) is the subject of today's post. Where the ribbing meets the sweater is often a weak spot in knitting. Along with the change of stitch pattern comes a distortion in the column of knit stitches, especially when switching from ribbing to stockinette fabric. Although this is no earth-shattering condition, it's so easy to improve that you might as well--for the cumulative effect of little improvements is greater than you might believe. For various arcane reasons, the transition zone between ribbing and the body of the garment is actually more of a problem for top-down ribbing. Therefore, as the second photo below demonstrates, the improvement is correspondingly more dramatic for top-down knitting. However, the first photo shows that bottom-up ribbing also benefits from an improved transition zone. For the purposes of this discussion, I assume you are at the point where you are going to switch FROM ribbing TO stockinette or a patterned fabric. On the LAST ribbing row, SLIP every knit stitch (slip them "open," also called purlwise"). Purl every purl stitch. After this last row or round of ribbing, switch to the larger needle you'll use for the body size, and begin the body of the garment. (Photo above) In bottom-up ribbing, the improvement is subtle, but still visible. The corrected knit columns bridge more directly from the ribbing to the body of the fabric (right arrow). Although it's hard to tell from this photo, the uncorrected transition zone (left arrow) features a bulkier transition from ribbing to the smoother stockinette fabric of the garment body. For the purposes of this discussion, I assume you have worked your garment down to the point where you want your ribbing to start. Using the needle size for the ribbing (usually a needle 2-3 sizes smaller than that with which you worked the body of the garment) work one last row or round in the body pattern (i.e. : the last row of stockinette, or whatever you were working). On the next row or round (the first row of ribbing) SLIP every knit stitch (slip them "open," also called purlwise.") Purl every purl stitch. After this first row or round, work the ribbing in the usual way to the desired length. (Photo above) The corrected knit columns bridge more directly from the body of the fabric to the ribbing (right arrow). The unimproved transition zone (left arrow) features wandering, zig-zagging knit columns. 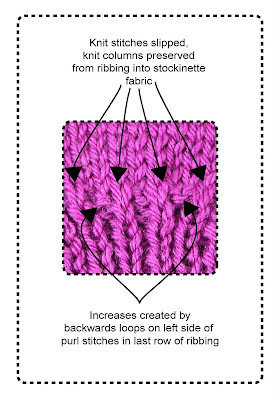 Marjorie, a reader of this blog, asks the excellent question of how to reconcile the technique set forth in the post--slipping the knit stitches--with the advice often given in patterns to start bottom-up ribbing on fewer stitches, and then increase to the larger body number of sitches "evenly in the last row." Per the photo (left) if the fabric above the ribbing is to be stockinette, or a near-stockinette fabric, it would be my advice to do all increases on a purl using an increase, such as backwards loop, which leaves a "bump." This "bump" will blend into the purls. By not making increases on the knit columns you will have preserved the attractive transition where the knit columns of the ribbing segue into the knit columns of the stockinette fabric above it. 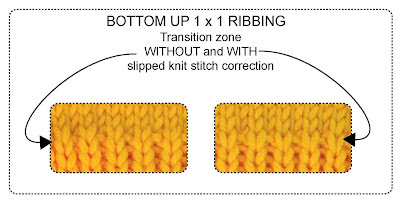 A final note: although 1X1 ribbing is demonstrated in bottom-up knitting, and 2X2 ribbing is demonstrated in top-down knitting, the directions given for bottom-up ribbing work for both 1X1 AND 2X2 ribbing worked from the bottom up. Similarly, the directions given for top-down ribbing work for both 1X1 AND 2X2 ribbing worked from the top down. If you want to work a 3X3 or larger, do a swatch to decide for yourself whether the slip-the-knit-stitches technique creates a noticible improvement over so wide a rib.